The akathist hymn is one of the most well-loved services of devotion in the Orthodox Church. Although there is some debate concerning the particulars of its authorship, many scholars agree with the pious tradition which states that the Akathist was composed in the imperial city of Constantinople, "the city of the Virgin," by St. Romanos the Melodist, who reposed in the year 556. The Akathist Hymn has proved so popular that many other hymns have been written following its format, particularly in the Russian Orthodox Church. These include Akathists to Our Lord Jesus Christ, to the Cross, to various saints, etc. The word "akathistos" literally means "not sitting," i.e., standing; normally all participants stand while it is being prayed. The hymn is comprised of 24 stanzas, alternating long and short. Each short stanza (kontakion) ends with the singing of "Alleluia." Each longer stanza (ikos) ends with the refrain: "Rejoice, O Bride Unwedded." The majority of the hymn is made up of praises directed to the Mother of God, always beginning with the salutation of the Archangel Gabriel: "Rejoice." In each of them, one after the other, all the events related to our Lord's incarnation pass before us for our contemplation. The Archangel Gabriel ( in Ikos 1) marvels at the Divine self-emptying and the renewal of creation which will occur when Christ comes to dwell in the Virgin's womb. The unborn John the Baptist (Ikos 3) prophetically rejoices. The shepherds (Ikos 4) recognize Christ as a blameless Lamb, and rejoice that in the Virgin "the things of earth join chorus with the heavens." 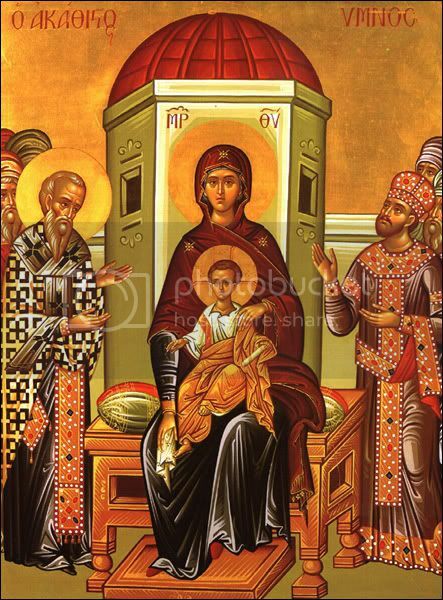 The pagan Magi, (Kontakion 5) following the light of the star, praise Her for revealing the light of the world. As the hymn progresses, various individuals and groups encounter Christ and His Mother. Each has his own need; each his own desire or expectation, and each finds his or her own particular spiritual need satisfied and fulfilled in Our Lord and in the Mother of God. So too, each generation of Orthodox, and each particular person who has prayed the Akathist, has found in this hymn an inspired means of expressing gratitude and praise to the Mother of God for what she has accomplished for their salvation. In the same way, may the readers of the akathists find God, the Theotoks and the Saints to be a help and consolation for their souls as well. OFFSITE: Akathists and Canons - Fr. John Whiteford's page, a great resource.